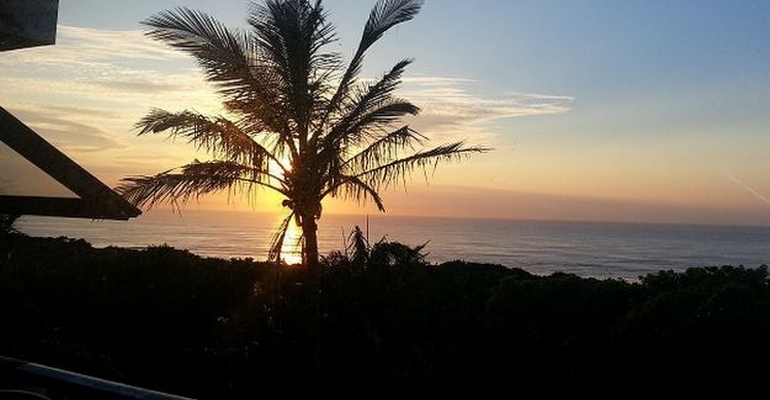 Isigidi Beach House is a self-catering holiday home that is situated in Melville, Banana Beach- between Port Shepstone to the South, and Hibberdene to the North. The house can accommodate 14 guests between 5 bedrooms and 2 shared bathrooms- ideal for a family or a group looking for comfortable lodging, close to the beach and away from city life. The house is spacious and tastefully decorated, with the bedrooms either equipped with a queen bed and/or 2 single beds. The living area is open-plan, with the kitchen containing a fridge-freezer, microwave, gas stove with electric oven, crockery & cutlery, and ample built-in cupboards, as well as other appliances. The lounge area has comfortable leather seating with a DSTV connection. The house offers uncapped WiFi and a smartbox with DVD library. Downstairs is the entertainment area which includes a bar and a pool table. The entertainment area leads out to the patio that offers a relaxing Jacuzzi and braai area and outdoor furniture. Secure parking is available for vehicles on-site. Housekeeping is available on Mondays and Fridays. Alternative days has to be pre-booked at an additional fee. Isigidi Beach House is within walking distance of the beach, as well as a short drive to shops, restaurants, a golf course and other attractions.